My Teen, The Alien: Twitter Travel Party Tonight! There's nothing really worth watching on TV tonight. No need to look. I already did. But your Monday evening doesn't have to be a total bust. If you're like me, you have your mind on summer vacation and are wondering where the heck you're going to take the family this year, right? 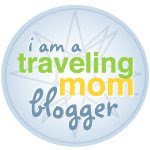 You'll find some GREAT ideas from other moms at TravelingMom.com's FIRST-EVER Twitter party! We'll be chatting for an hour about everyone's favorite topic - TRAVEL! Specifically, we'll cover fun themes like "How To Get Great Travel Deals" and "Relaxing on Vacation," plus doing TONS of fun giveaways! Please, join us from 9:30-10:30 EASTERN STANDARD TIME . . . TONIGHT . . . to pick up some awesome travel tips and ideas for your family's summer vacation.